This illustrated report covers an eight day trip to Germany from 30 January to 6 February 2014. 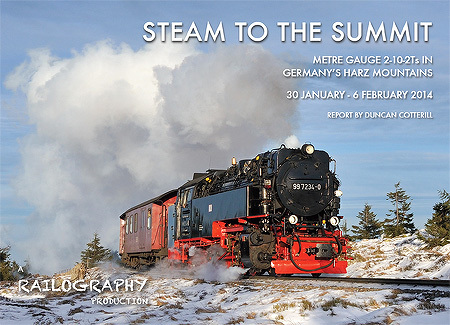 The Harzer Schmalspurbahnen operate a 140km network of metre gauge railways in the Harz Mountains in northern Germany. Once part of the Deutsche Reichsbahn, the system became a tourist railway following the collapse of the Iron Curtain in 1989 but has retained a lot of its original character and still operates many services with steam locomotives. I also managed a few hours looking at the current scene around Hannover with the emphasis on freight. The main illustrated report is in pdf format. Click on the cover image (right) or the link below to view or download it. Warning 10MB file.